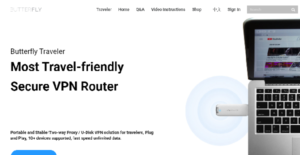 Butterfly VPN Router is a travel VPN device designed to provide users with instant access to the Internet via public WiFi hotspots but with the added security features that a VPN entails. This product is ideal for travelers, bloggers, people on business trips, basically just about anyone who needs to access the Internet securely or see websites that are otherwise blocked or banned if they were viewed normally (think China and Facebook). It lets you use more than 10 WiFi devices simultaneously and choose from 6 regions: the US, China, Japan, Singapore, Taiwan, and Europe. Butterfly VPN has three modes: Intelligent Mode; Full Mode; and Tor Mode. With the intelligent mode, the router provides you with an automatically optimized line selection. With the Full Mode, all contents go through the VPN while in the Tor Mode, all contents are channeled and delivered through a distributed network and greatly increases security. The device also has an ad block, zero interaction protocol, and strong encryption. Each license lets you connect unlimited devices. Butterfly VPN Router comes as a USB mini-size portable wireless VPN router. It is a plug-and-play device which makes setting it up a breeze and you don’t need to be an internet network configuration genius to get the product working. Simply connect the USB to a power source including a personal hotspot from a mobile phone, plug in the device, activate Butterfly VPN, and surf the web securely and freely. Butterfly VPN supports all Internet-capable devices, including computer, laptop, cell, Tablet, TV boxes, Kindle, Xbox, PlayStation, and more. You can connect a maximum of 10 devices at the same time and enjoy the internet with no ads and no blocked content for three straight years. With Butterfly VPN, you can access websites that are ordered blocked and banned by the authorities. For instance, you can’t view Facebook in China. Butterfly VPN’s technology allows you to visit not just Facebook, but other banned websites like YouTube, Instagram, and Gmail. And it’s not just China. Butterfly VPN lets you access the blocked content and websites in the US, Japan, Singapore, and Europe, among others. It offers unlimited data and fast access through its two-way proxy. It has three modes: Intelligent, Full, and Tor. The Intelligent Mode uses an AI system to automatically choose the best line, whether it’s VPN lines or “NO VPN” line, based on which website you are visiting. The Full Mode enables access to geo-blocked services. Finally, Tor Mode is ideal for more experienced users. Whenever you need to further bolster your online privacy and keep your internet activities under wraps, Butterfly VPN lets you do so with the Tor Mode. With it, you can hide IP address, online activities, and location, enabling you to protect sensitive information like credit card info and passwords. It provides a good value for your investment with its three-year subscription deal and the low monthly subscription pricing at $1.99/month after three years. This tool is reliable in keeping your connections private and secure and bypassing geo-blocks. What Problems Will ButterflyVPN Router Solve? When you travel to other countries such as China, this portable VPN router can be used in public WiFi (hotel, airport, coffee shop and etc.) and help you access Facebook, Gmail and YouTube. Under the default mode-Intelligent Mode, you can access different IP region at the same time. and access blocked content. Butterfly VPN can support up to 10 Wifi devices. Tor Mode keeps your online activity private. Mask your IP address online activities & location with the no-log VPN. If you are interested in ButterflyVPN Router it could also be sensible to examine other subcategories of Best VPN Services gathered in our base of SaaS software reviews. Since each organization has unique business needs, it is sensible for them to abstain from seeking a one-size-fits-all perfect software system. Needless to say, it would be futile to try to find such an app even among popular software applications. The smart thing to do would be to list the various essential factors that need consideration such as main features, finances, skill levels of staff members, company size etc. Then, you should do your groundwork thoroughly. Read some ButterflyVPN Router reviews and investigate each of the other apps in your shortlist in detail. Such in-depth groundwork can make certain you weed out ill-fitting applications and select the app that offers all the features you require for business success. How Much Does ButterflyVPN Router Cost? Butterfly VPN offers one of the lowest pricing in the market. Your hardware purchase, starting from $89, already includes a 3-year subscription. After 3 years, the subscription costs only $1.99/month. We realize that when you make a decision to buy VPN Services it’s important not only to see how experts evaluate it in their reviews, but also to find out if the real people and companies that buy it are actually satisfied with the product. That’s why we’ve created our behavior-based Customer Satisfaction Algorithm™ that gathers customer reviews, comments and ButterflyVPN Router reviews across a wide range of social media sites. The data is then presented in an easy to digest form showing how many people had positive and negative experience with ButterflyVPN Router. With that information at hand you should be equipped to make an informed buying decision that you won’t regret. USB power + wifi network is all you need to get this device working! What are ButterflyVPN Router pricing details? What integrations are available for ButterflyVPN Router? ButterflyVPN provides a great 2-way proxy that keeps you secure and anonymous online. It is great value for money with its 3-year initial subscription and low monthly costs after this initial period.